Crazy Cakes and Eskimo Kisses: Before You Say, "I'd Never Forget My Kid in The Car"
Before You Say, "I'd Never Forget My Kid in The Car"
Today, I began my regular daily routine of getting three people dressed, fed and out of the house before 6:30 a.m. Unlike normal, I had to drop my oldest off before taking my youngest to daycare and heading into work myself. Unlike normal, when I got into the car I realized that the car was on "E" and I would need to go to the gas station. As I pumped gas, I waved at both of my kids in the car. We made silly faces at one another, and I did my best to hide my annoyance that the gas station stop was costing me precious minutes. Needing a sense of normalcy, I re-entered the car and began to think about my work day ahead. This is a pretty standard routine for me. I drive to work, and I make my mental checklist of work-related tasks. Finish grading 120 essays. Check. Return a parent phone call. Check. Clean out that random file drawer that has begun collecting random papers. Check. I began to relax. Until, I heard my 8-year-old's voice pipe up from the back of my car, "Mom are you forgetting something? You forgot to drop me off." After my initial "how the heck did I forget a 60 pound, non-stop talking, 8-year-old in the back of my car" freakout moment, I backtracked 5 miles to drop her off. 5 miles. I drove for 5 miles without even realizing my child was in the car. How? Because my normal routine was disrupted? Because like so many other working parents I'm under rested and overworked? I'm not sure. But one thing I know is that it had nothing to do with lack of love or terrible parenting on my part. Every year around this time, news articles about children left in cars begin to fill my social media pages. The comments left by people under these stories sometimes offer condolences and many times attack the parent. I understand the feelings that many commentors have -- frustration and anger, sadness and fear. 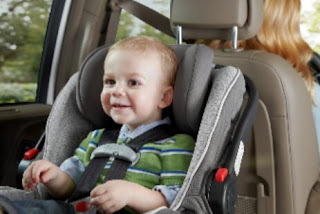 Often, people are quick to say "I would never leave my child in the car. There's just no way." Comments such as these give us a false sense of security that we are above such actions. Our kids are safe. We are safe. However, I realized how easy it is for something like this to happen. To anyone. Anywhere. In fact, from 1998 - 2016, there were 700 heatstroke deaths as a result of children left in cars. 700. Anyone. Anywhere. You and me included. Unfortunately, most of the stories which involve parents forgetting their children in cars do not end the way mine did -- with a simple fix. The reality is, no matter how much we love our children, accidents and mistakes do happen. Judge less, love more. Tips to Prevent "Forgotten Baby Syndrome"